Hey everyone GEOARM Security presents the new Honeywell LYNX Touch L5210 wireless security panel. The system hosts a 4.3 inch high definition touch screen display with words and icons that are very large which makes it easy for you to manipulate the menu driven navigation system. The system has 2 plastic button keys – which makes it simple to find the home screen and emergency functions. With the activation of GEOARM’S Total Connect 2.0 with these panels there are some awesome add-on features such as emergency tornado warnings and traffic alerts. The L5210 touchscreen will allow you to view up to one camera on the actual display as long as you have the L5100 WIFI CARD attached. The supported cameras are as follows ipcam-wo, ipcam-wi2 and the ACU “analog converter unit”. If you only wish to view the camera from your smart device than any of the L5210 wireless kits that support total connect 2.0 will work wonderfully with your supported cameras! The L5210 has a high level of functionality with z-wave Technology. 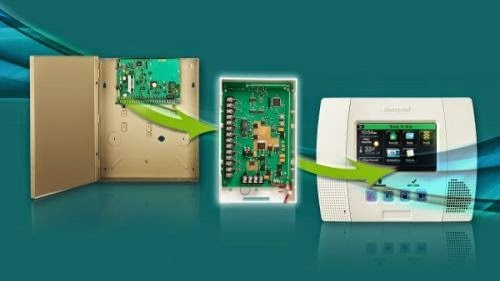 This means you can control and automate your, lights, locks, sirens, thermostats, garage doors and water valves from the actual panel itself or while using the Honeywell total connect 2.0 applications. Don’t forget to activate APL or advanced protection logic commonly known as smash proof “this feature can only be added if you have the internet, cellular or dual path panels". We all know as business and home security technology equipment gets more and more advanced, it will become easier and easier for the end user's to do their own installations/maintenance on new security system's or existing alarm system's for alarm monitoring. That will mean there will be less of a need for the security companies out there to have to physically send a technician to your home for any reason. This will in turn mean less overall costs associated with having a security system and more privacy by not having to allow stranger's into your business or home. One of the biggest reasons for this advancement is the evolution of YouTube and the growth of the howto and style genre videos section. 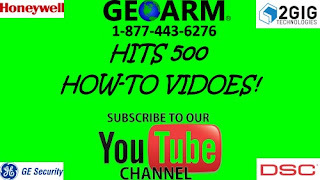 GEOARM Security is one of the pioneers of these type of videos and we are proud to announce that the GEOARM Security YouTube page has hit 500+ DIY security videos. These videos assist all of the DIY security end users whether they are a client of ours or not. We wanted to let the world know we are dedicated to providing you with highest quality and most informative DIY security videos for older and brand new wireless, wired, and hybrid security systems. The 5800C2W enables retrofitting existing security systems by; converting their wired sensors to Honeywell’s 5800 series wireless technology, and replacing the existing control panel with a LYNX Touch or LYNX Plus series control. The 5800C2W also works with residential VISTA control panels equipped with a wireless RF receiver and keypad. It saves on installation costs, time and materials since there is no need to replace wired devices with individual transmitters. The calibration feature on the 5800C2W solves a frustrating problem, When converting hardwire to wireless zones, the first thing you need to do is find all the resistors. Many times resistors can be in the walls or buried in the window frame. Tried digging those out? Talk about labor! The 5800C2W has a one button calibration. Press it and forget about resistor issues. It will automatically calibrate the value from 2k to 9k. Now that’s a labor saver! The Image Sensor is a breakthrough product that combines a PIR (Passive Infrared) motion sensor, an integrated still camera, completely wireless communication, and Alarm.com Interactive Services. The Alarm.com Image Sensor offers an entirely new service that is designed to deliver better security through visual verification of alarms and increased engagement through on-demand property views. The Image Sensor (model ADC-IS-200-LP) is compatible with Simon XTi panels (version 1.0 & up), Simon XT panels(version 1.3 & up), Concord 4.0 panels and requires an Alarm.com module (version 146 & up for XT, 151 & up for XTi, 177 & up for Concord CDMA, 173 & up for Concord HSPA) with an attached Image Sensor daughterboard. Not only is the image sensor compatible with the wireless GE systems listed above but, it is also compatible with the 2gig go control panel. The only difference in installation is that the you will not need the daughterboard but, you will need to add the 900 mhz transceiver along with the image sensor itself and you will be ready to start capturing images!